Chris Doak will make a last minute decision on whether to play through the pain barrier to try and regain his European Tour card for next season. The Scot finished 153 in the rankings and needs to compete at the European Tour School over the next two weeks to qualify to play on next year's circuit. Doak, 37, has been hampered by a trapped nerve in his neck. "It all depends on an MRI scan to see where the trapped nerve is coming from," Doak told BBC Scotland. "So I'll wait for doctors advice and take it from there." Doak will undergo medical tests on Monday and the outcome of that will determine whether he goes to Spain to try and qualify. The injury means that he has only about 30 percent grip pressure in his left hand due to a loss of feeling in two of his fingers. He explained it was a simple everyday act that seems to have caused the problem. "I fell asleep in a weird position on my left arm and I woke up, as you do sometimes, with pins and needles," said the Glaswegian. "I thought it would go away in 20 minutes or so and here we are seven or eight weeks later and it's still there." He admits he wants to take the gamble of going and competing in Spain, but the uncertainty over what that would do for the injury long term leaves him frustrated. "The medics have so far said it's time and rest but the fighter that's in me is constantly urging me to go, but I'll have to wait and see what the doctors say after the scan." Doak made the cut in only eight of the 29 tournaments he participated in this year and on five occasions he either withdrew or retired before completion of his second round. "Nobody ever wants to come off the golf course," he said. "I had come off a few tournaments before the actual injury kicked in with twinges in my wrist thinking it was just poor shots or bad lies. "But putting all the pieces together, it's probably leading up to the situation it's in just now." Finishing out with the top 110 golfers in this year's Race to Dubai rankings meant he failed to retain his card for next season. Doak was 153rd in the 2015 rankings compared to 71st in 2014 which was the best season of his professional career. 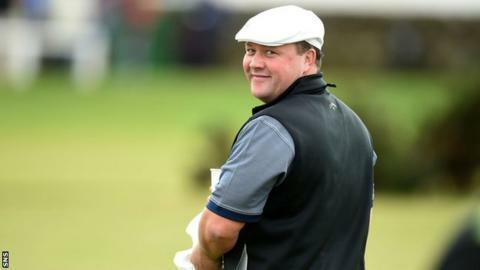 That year he was fifth at the Alfred Dunhill Links Championship and tied for 12th place at the BMW PGA Championship at Wentworth. "After the season I had last year I thought I was only going to climb the ladder even more, so it's been disappointing," he explained. "I didn't really play well at the start of the season and typically I've never played well at the start of any season but it's a different story this season towards the end. "Usually I do well at the Dunhill or tournaments in the UK, but unfortunately I've had to walk off these tournaments due to this injury." Doak is aware that if he is unable to compete at the Tour school it will be a return to the Challenge Tour for him next year. He said: "I'll hopefully rely on some invites from the tournament promoters next season and from the Tour, other than that it will be back to the Challenge Tour to get my card back from there. "But obviously I'd rather be playing on the main tour where I've been the last few years. "It's the not knowing what the next season's going to hold that is frustrating and how this injury is going to pan out. "Hopefully we're going to find out after the scan and that will put some clarity on it."